Fundamental changes in the global trade landscape in terms of considerably expanding trade volumes and rapidly advancing global fragmentation of production processes have opened up new opportunities for many economies. The ensuing analysis determines whether these new opportunities have actually translated into real gains and have helped foster economic performance in terms of economic growth, employment generation and labour productivity improvements. It uses the WIOD database for all EU-27 countries and shows that between 1995 and 2007, vertical specialisation intensified in all EU member countries (but the UK) but intensified the most in the new Member States. 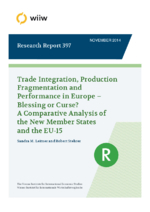 Moreover, it demonstrates that export growth is beneficial to performance, particularly in the new Member States. Likewise, stronger participation in global production processes is performance-enhancing as results indicate that export growth and the degree of vertical specialisation tend to reinforce each other. In particular, the effects of export growth on macroeconomic performance tend to be even higher if vertical specialisation is high.